We came across Felicia Wong's impressively intricate confections at a wedding industry trade show last year. Adorned with impressively detailed hand-crafted sugar flowers and plants, her wedding cakes immediately made Kim and I take notice. Originally from Australia, Felicia began creating custom cake designs in Montreal in November 2014, but it wasn't until May of 2017 that Sweet Savour by Felicia became a full-time operation. When I asked her what led her to the field of custom cake design, she replied "I don't know! When I started cake decorating, I hated it." However, the experience she gained from working in various bakeries and being thrown in the deep end when it came to learning new techniques allowed her to define herself as a cake artist, discovering parts of it that she truly loved. Sugar flowers are one such passion. Felicia is a self-taught sugar flower artist, who primarily learnt her craft by watching online tutorials. She further developed her style by taking inspiration from her observations of nature and actual plant life, sometimes using reference photos as a starting point. She describes her sugar flower designs as straddling the line between realism and stylized, surreal, fantasy-inspired flora. As a relatively new business owner, Felicia says it's been very rewarding to see clients approach her who are already familiar and fond of her work, looking for an original cake design. "I really don't like copying other people's designs or doing copyrighted stuff. So to get people who are like "I'm interested in your originals, can you design me something?" That's cool," she said. Felicia is a bit of a polymath, eager to learn new trades that she can apply to her work, in both direct and indirect ways. She's taken calligraphy classes, something she now enjoys incorporating into her cake designs to add a bit of a refined look. 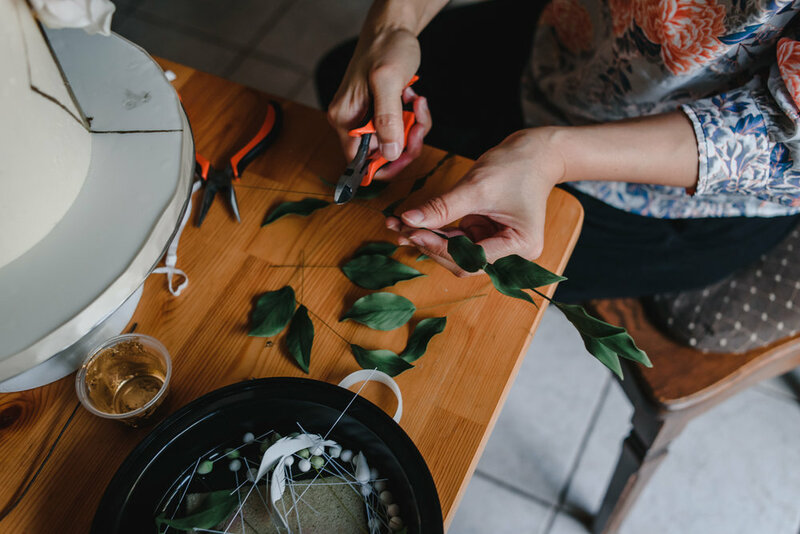 She also takes classes working with real flowers, like Japanese flower arranging, in order to open her mind to other ways of approaching incorporating flowers into her cake design, whether via painting or sugary confections. Felicia was gracious enough to let me spend part of an afternoon with her, watching her work and seeing her lovely ideas come to life. While I could try to put my impressions into words, it's best to simply look at these images of her cakes in various states of completion. I've no doubt you'll be impressed.